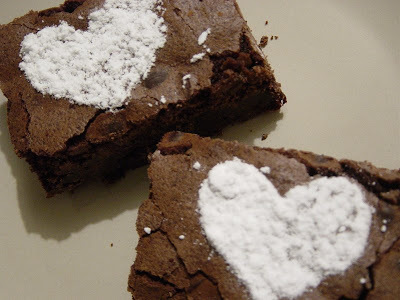 I reckon this must be the best Fudge Brownie recipe out there... it always turns out the same and is absolutely delicious! I picked it up from a friend at our Playcentre and have preferred it over all the others in my recipe books ever since. Sift cocoa. Add melted butter, sugar, eggs and vanilla. Mix to a smooth paste. Sift in flour and baking powder and then add choc chips. Pour mixture into 20x30cm tin lined with baking paper. Bake in preheated oven 140c for 65 mins on fan bake. The slice will be soft to touch and may look undercooked, but that is quite normal. Cut when cool. Cooking time may vary slightly in different ovens. Enjoy!! These ones were made late last night especially for our awesome team on creche duty at church today - you guys rock! These look delish, I will have to give them a go. Love the heart detail too. I just looked at Dr Lizzy....too funny, will leave her a message one day soon. I just realised I have "and other random things" on my title page and so do you.....I will come up with something new since you did yours first, I didn't mean to be a copy cat! Not that you probably care. That husband of yours has a weird and wonderful mind..........cool. They look so yummy...love the heart idea too!